Two bedroom, 1 bath open floor plan. Ground-level and pretty, fenced-in yard. Perfect for guests with pets! There's so much to do on the Mississippi Gulf Coast, and this is a great place to launch. This property is located on the eastern edge of Pass Christian, Mississippi, near Long Beach. There is ample parking and a place for your boat, too! Ideal for couples or families. Will accommodate 4-6 people. Respectful pet-owners and their pets are most welcome. Our little cottage has all the creature comforts of home, including a piano for music lovers! Within a 10 mile radius there are fabulous restaurants, golf courses, harbors, casinos, deep sea fishing, pier fishing, wade fishing, quaint shops, antiques, beautiful views, parks and walks, river rafting, historical homes... and of course, the beautiful, white sand beaches! Only an hour from New Orleans! Originally from New Orleans, I moved with my family to the area when I was young and grew up less than three miles from this precious little house, where my grandparents retired. I still live close by in nearby Long Beach. It has meant a lot to me to restore and remodel this home, making it 'new' again. It is my pleasure to make it available to others to enjoy. This property has been in my family for a number of years --- my grandparents retired here, and my father lived here, too. I acquired it in 2010 and named it Cocoa's Cottage, after my dad's canine companion. This cottage is completely fenced in--- a great place for children or pets to play. Also, it is wheel-chair friendly. Are you a musician? This cottage has a spinet piano for you to enjoy. Cable, wireless internet, stainless appliances, jalousie windows, ceiling fans, oak trees, spacious front porch and back patio for grilling. Parking for up to four cars and/or a boat. The beach view is just a very short walk away. We are .3 miles from the beach! Carport, driveway in the fenced yard and another parking pad outside of the fenced yard. Stainless appliances: Electric oven/stove; small appliances-- toaster, coffee pot, blender, etc. There is a dining table that seats four and bar table that seats 2. (3) Cable television in each room and living area. Each room has a dvd player as well. Fenced in Yard in front and back yards. Perfect for kids and pets. Three touring bikes and helmets. Fenced yard; spinet piano; outdoor living spaces; ample parking for cars/boats. Ground-level entry and no stairs to climb! 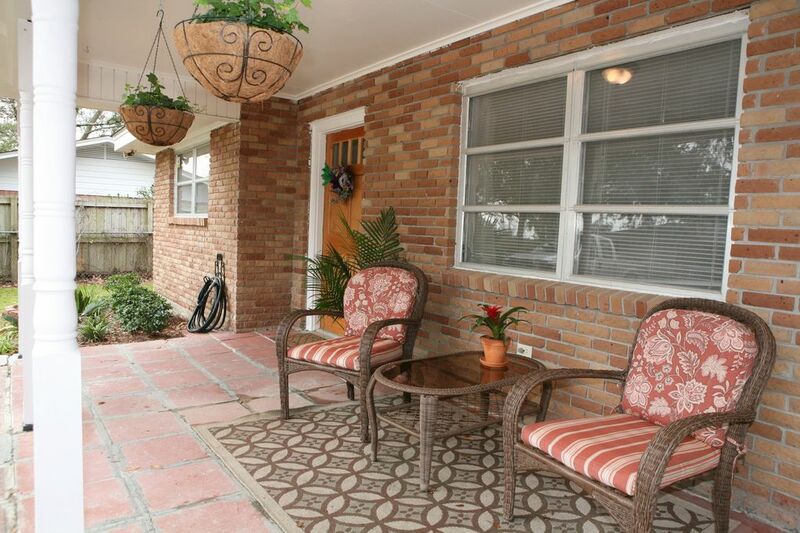 A very pleasant cottage with everything one needs for a home away vacation. Very clean, well furnished home that is in a very peaceful setting only a couple blocks from the beach. I would definitely return for a visit on our next trip to the area. The owner is very accommodating and friendly. Rick & Paula from Tennessee. Thanks for the feedback. I’m glad you and your pets enjoyed the time at my sweet little cottage. I try to make sure my guests are comfortable. I’ve never had negative feedback about the beds before—Some folks like firm beds and some like soft. I’ll take to heart your recommendation, however, by adding memory foam toppers to the beds so that comfort can be adjusted. This cottage is really relaxing and comfortable. The two bedrooms are quite large and the living spaces have been opened up to feel very open. Back yard is nice. Short walk to the beach. Close to shopping. We’d definitely stay again. Thank you so much for your review. So very glad you enjoyed your stay! Our home on the coast! Return stay and as usual, house & Lauren did not disappoint. We love this place! Everything you want in a vacation home. Lauren has the home stocked really well & always clean. Wonderful beds! Feels like home! Only place we stay at the coast!! We enjoyed our stay. A few minor issues but nothing that caused our stay to be interrupted. The bed in the master bedroom was pretty squeaky & all the beds were on the firmer side. It’s literally right down the road from Walmart & the beach is right across from there. We’d definitely stay again. Thanks for your review, Theresa. I appreciate your feedback, because it helps me to better provide my guests a quality vacation experience. I wasn't aware that the bed started squeaking, as none of my other guests have had issue with it. I will definitely see what I can do to make things better! The property was quaint and very clean. The yard is completely fenced-in and pup friendly. The host was very responsive. I’d definitely stay again. Cocoa's Cottage is located on the east side of Pass Christian near Long Beach, MS --- and right off of the the playful waters and beaches of the Gulf of Mexico. Convenient to several golf courses, 6.8 miles to Island View Casino in Gulfport and 11.4 miles to Hollywood Casino in Bay St. Louis. Convenient to Wal-mart. Centrally located between Long Beach and Pass Christian Harbors. A fabulous spot! Flat rates are based on 1-4 people. Additional charge of $25 per person per night are applied at owner's discretion for 5th and 6th persons. Number of guests must be disclosed to book rental. Either a $200 REFUNDABLE security/damage deposit OR the VRBO $49 NON-refundable property damage protection coverage required.